I've been a little quiet on the blog front recently, mostly because I have just fit three trips and two weddings into the last two months. Any trip with a toddler is tiring, and three in a row was, well, also tiring. Not to mention my hubby made a same day turnaround from the last trip to fly to NZ for work (poor thing). He says he is working hard, but I much prefer to picture him pretending to be Frodo in the middle of the most beautiful scenery I have ever seen. So, meanwhile back here in CA, I'm a bit travel weary and distracting myself from missing my husband with a lot of Project Runway, crafting, party planning, and blogging. Which brings me to this little project I made as a wedding gift from the first of the two weddings this month. Right on the shores of Lake Tahoe on a spectacularly clear day, it was likely the most beautiful wedding I have ever attended. I went back and forth on what to purchase the newlyweds. With my inclination to handmade and personal gifts, I sometimes find solely purchasing from the registry a bit boring. Don't get me wrong, I always get something from the registry. The couple has spent a long time picking out exactly what they want to start their home together, I figure I should pay attention. However, exclusively buying off the registry can feel a bit impersonal. I have started doing two things to add a little personality: picking a theme and adding a little DIY goodie to accompany the gift. For example, say the couple registers for a glass pitcher, I would then add my favorite hand lemon/lime juicer, and my favorite recipes for sangria and margaritas. It doesn't have to be elaborate, but just the little extra touch makes it feel a bit more special. For this recent wedding we purchased the couple a lovely big slate cheese board from the registry. And what do I pair with cheese? Wine, obviously. 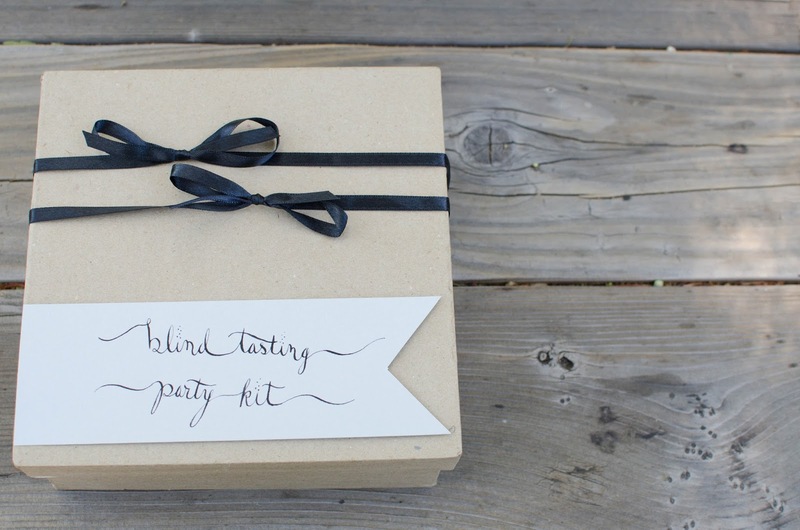 But instead of buying a bottle of wine, I stole an idea from a party my sister-in-law threw a few years ago and created a Blind Tasting Party Kit. 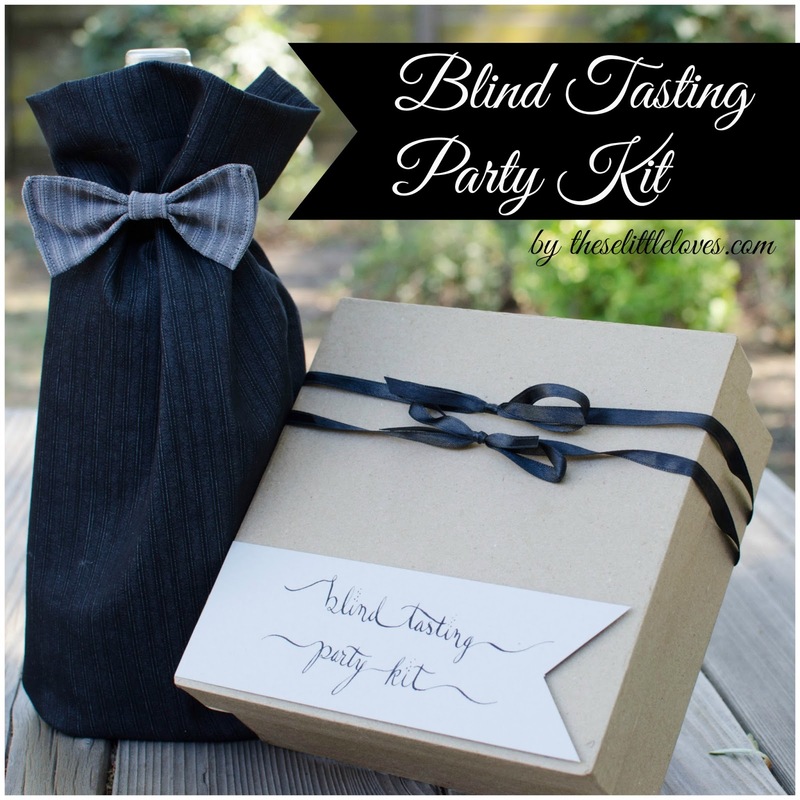 (If you are unfamiliar, the idea behind a blind tasting party is for the guests to taste 4 unmarked bottles of the same type of wine or champagne and rank them according to price.) 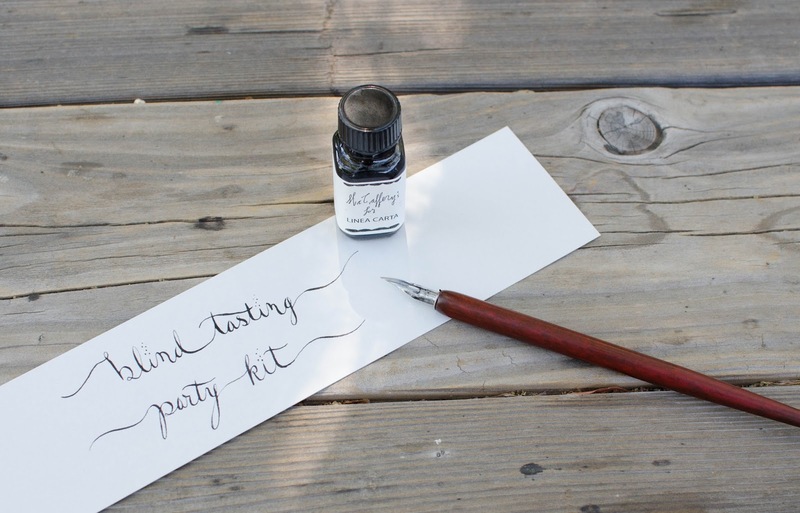 This gift kit is not exclusively for weddings, but I particularly love the idea for such an occasion as it is intended to get the couple excited about hosting a party as newlyweds. As with any handmade gift, my goal was to keep it classy and modern (not 'crafty'). And what says classy more than a wine bottle in a suit and bow tie? To complete the styling, and true to my current obsession, I also detailed the cards and tags with a modern calligraphy. And as a little gift for you, I have included files of all the calligraphy used in this project if you want to use the same look! Check it out here. Cut four 9" x 31" rectangles out of the fabric for the wine bottle 'suits'. I used a subtle black and gray pinstripe I found on a big sale at Joann's. 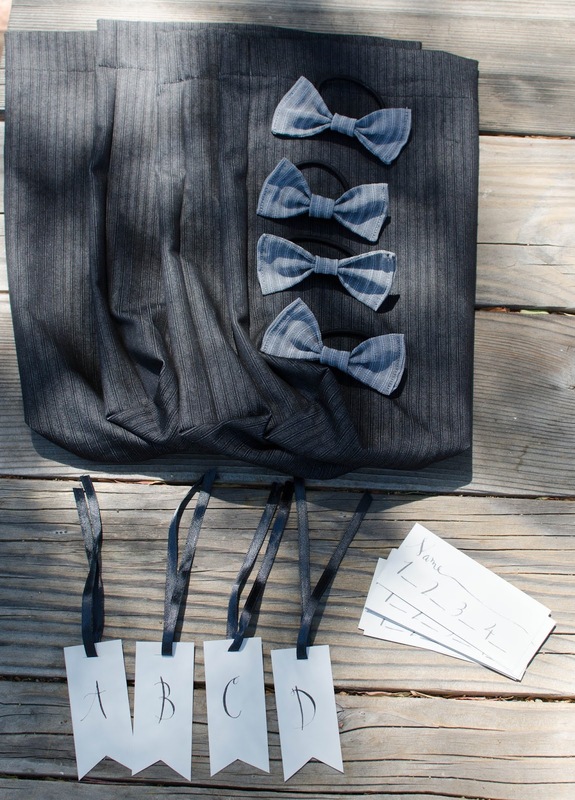 It even had an awesome lighter gray on the wrong side of the fabric which turned out perfect for a contrasting bow tie. 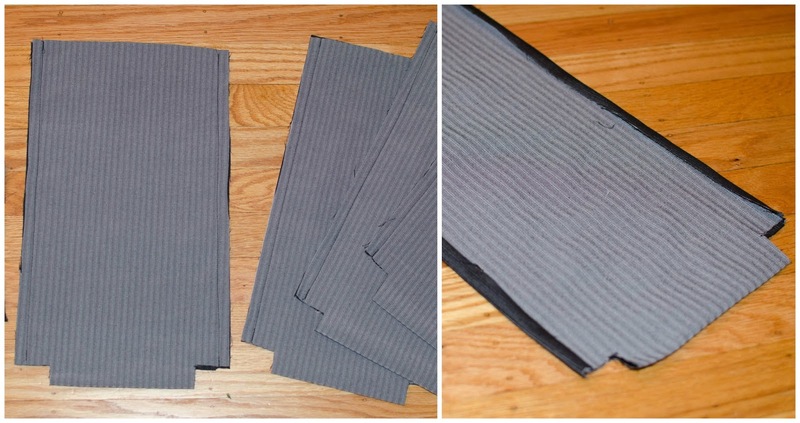 Fold each rectangle in half so that you have four 9" x 15.5" pieces. The fold line will become the bottom of each bottle bag. 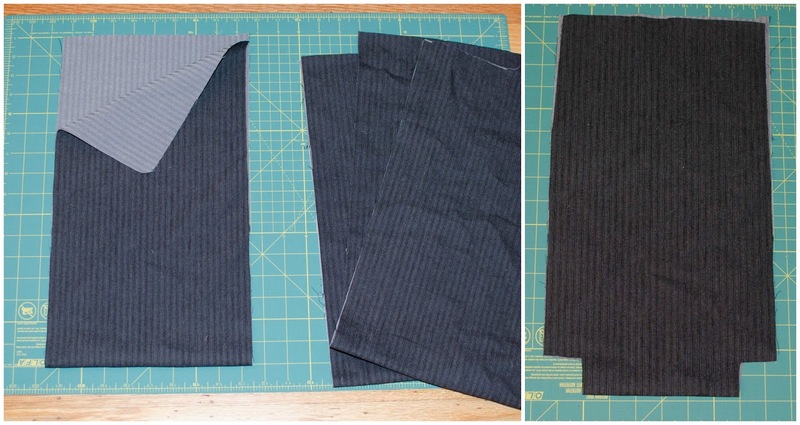 Cut a notch on both sides of each bag where the cut side meets the fold line. Each notch should be 1" tall and 1.5" wide (using the same orientation as the wine bottle height and width). Now turn each piece of fabric so that it is still folded in half, but with the wrong side of the fabric out. Pin and sew along the two long sides of the bottle bags with a 1/2" seam allowance. Do not sew into the notch. Iron these seams open flat. Next match up the top of the notch with the bottom of the notch and seam with a 3/8" seam allowance. To finish off the top of the bottle bag, while the bottle bag is still inside out, fold out the top 1/4" all around the top, pin, and seam the top with an 1/8" seam. Then fold the fabric out again 1" to 1.5" and seam directly on top of the first previous seam. Turn right side out. 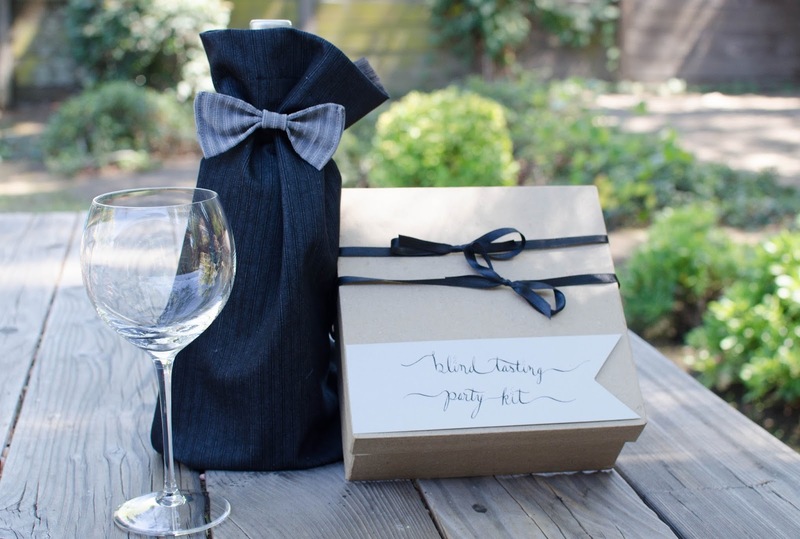 To make the bottle bow ties, take each 4" x 4.5" rectangle, fold it wrong side out and iron it in half so you have a 4" x 2.25" rectangle. I'm going to suggest two ways to start the bow ties. First, there is the way I did it: Sew along the long edge of the rectangle. Turn the rectangle right side out. Fold in each end pin together. Top stitch each end with a 1/8" seam. 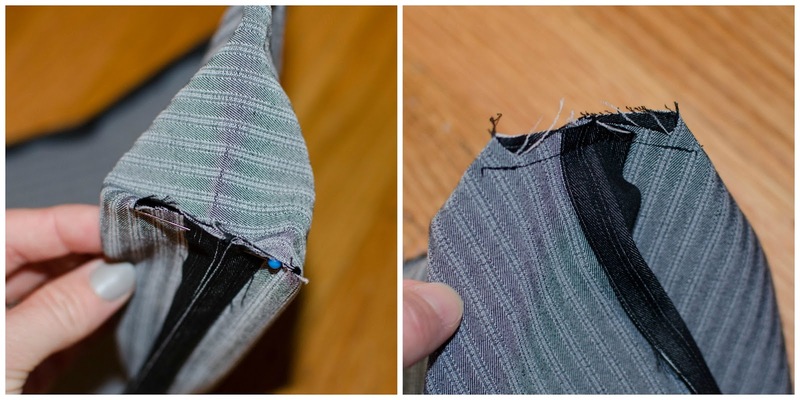 Now, there is an alternate way that removes the topstitching on either side of the bow tie (I don't have photos here): Start with the ironed rectangles. Sew along the two short open sides with a 1/8" seam allowance. Then sew along the open long side, leaving a gap in the center to turn the bow tie right side out. Once sewn, turn the bow tie right side out through the gap and iron flat, folding over the fabric at the gap to match the seam. The rest of the instructions for the bow ties are the same regardless of how you completed the above steps. Then pinch the fabric in the center neatly and stitch two short segments along the bow tie center to keep it pinched together (this would close the gap if you did the alternate method). On a side note, how fabulous is this manicure. I just tried Jamberry nail wraps for the first time - super fun! Next take the 4 small strips, fold the top and the bottom into meet the center (right side out) and iron flat so that you have long thin strips. Wrap the ironed strip around the center stitched part of the bow tie and a hair elastic and stitch in the back. 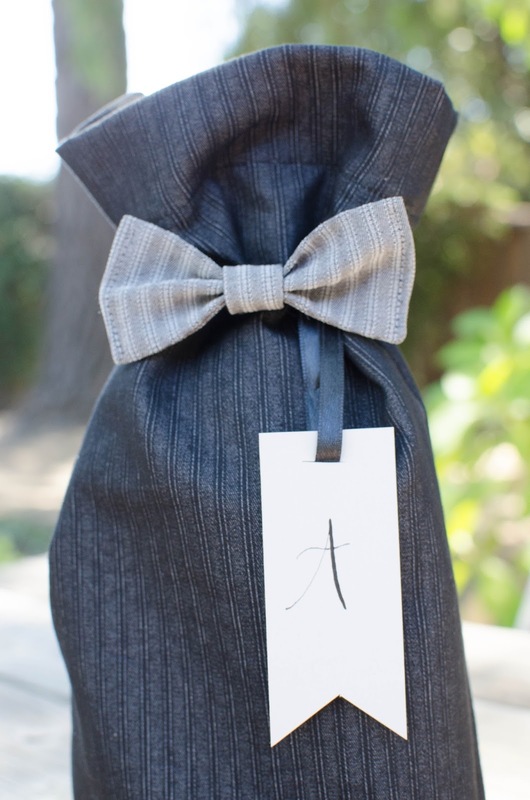 The hair ties easily wrap around the bottle to close the bag and it completes the look of the suit. 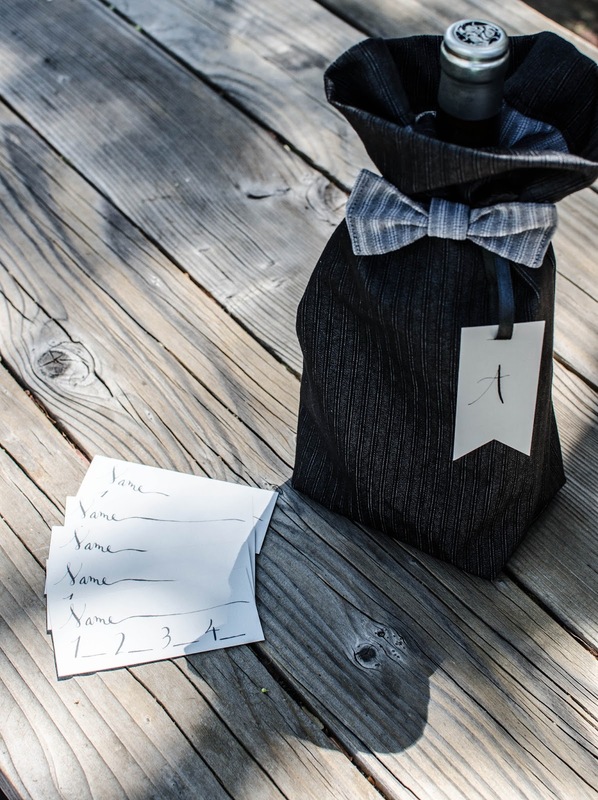 Now for the game, you need four tags (one to identify each bottle) and cards for each guest to record their guesses. To match the suit fabric, I chose a light gray card stock and a dark black ink. 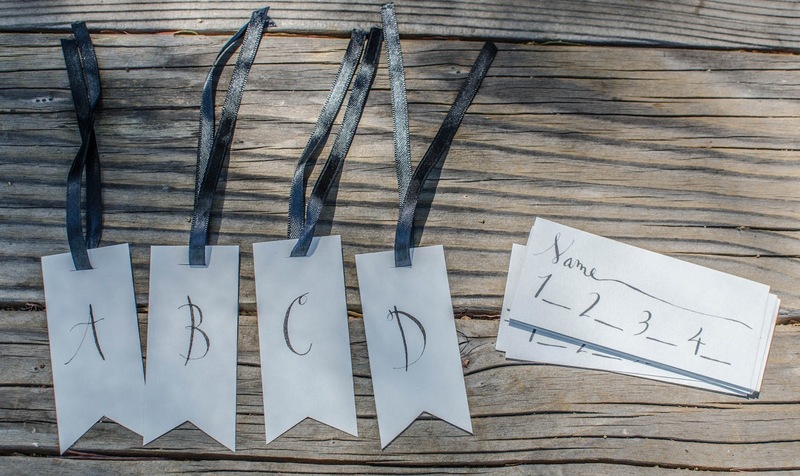 I hand calligraphed the four tags (A-D) and added a strip of black ribbon to each. To prevent having to hand calligraph all the guest cards, I created one template, scanned it, and then printed it onto the same gray card stock which I then cut into strips. I've included the file here so you can use the same cards and tags. The final step was packaging. First, I purchased a simple brown kraft gift box from Michaels. 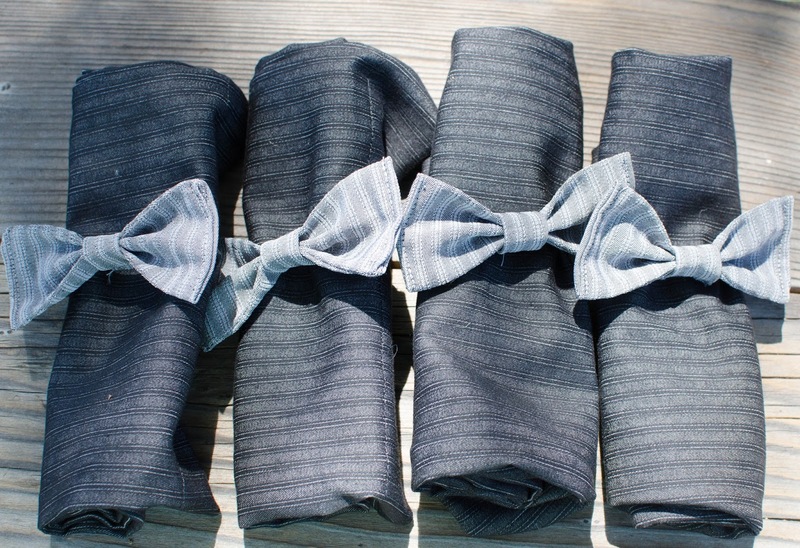 I rolled up the four suits and lightly wrapped each one in a hair elastic bow tie. 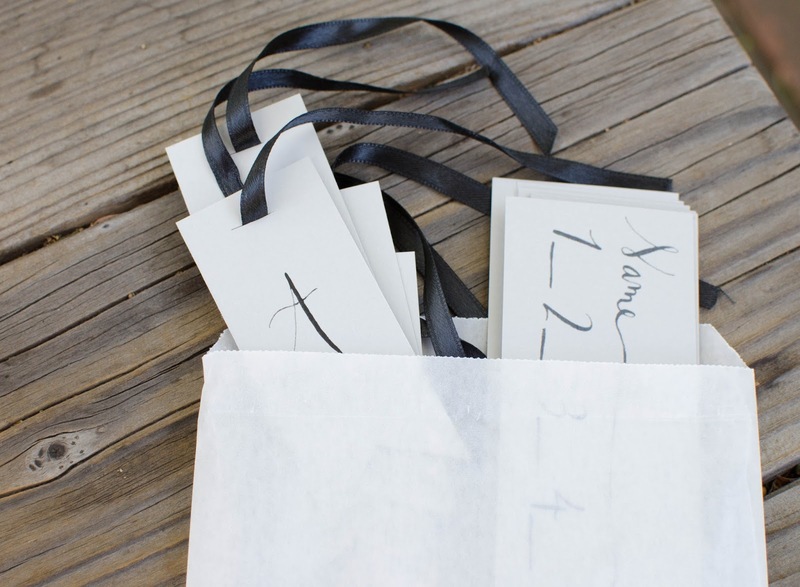 I packaged the cards and tags in a glassine bag, sealed with washi tape. And finally, I printed an instruction sheet (included here) explaining the game. After it was all packed up neatly in the box, I couldn't help but add a calligraphy label to the top of the box and a few bows with the same ribbon from the tags. And there you have what is sure to be a unique wedding gift and hopefully a fun party!